Did You Know that according to the best evolutionary models, many of the planets in our Solar System should not exist? Recent discoveries have supported the Biblical account of Creation. The planets, stars, and galaxies in our Universe all defy the secular model in multiple ways. Instead of supporting an atheistic model of origins, science is revealing that the heavens declare the glory of God (Psalm 19:1). The Our Created Solar System DVD starts to reveal what you aren't being told by the secular media. In this video, you'll tour our magnificent Solar System. You'll visit each planet through more than 200 beautiful photographs and graphics from NASA and other sources. You will see how each planet uniquely testifies of its Creator. In Our Created Stars and Galaxies you will travel beyond the Solar System and explore the entire Cosmos, through 130 breathtaking photographs, videos, and graphics from NASA and other sources. Secular astronomy models fail to explain the heavenly bodies. Conversely, the Biblical account of Creation is consistent with what we see. 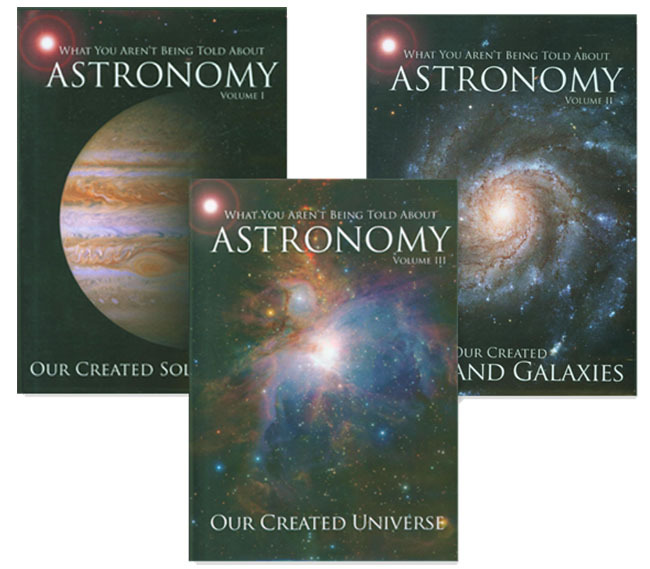 In the third DVD of the set,Our Created Universe we see that an objective evaluation of the evidence does not support a self-creation of the cosmos, and that viewing the Universe in light of Scripture gives us tremendous insight into the Creator's majesty, His character, and what He has done for us. Your host is Spike Psarris, a former engineer in the U.S. military space program. He entered that program as an atheist, and left it as a creationist and a Christian.